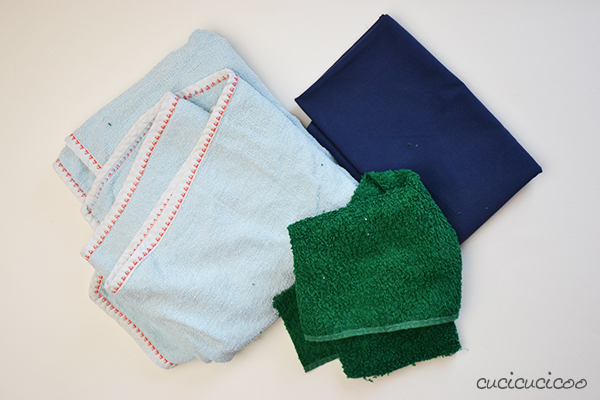 Home Tutorials (all) DIY Gift Tutorials Sew a bathroom rug… from towels and sheets! 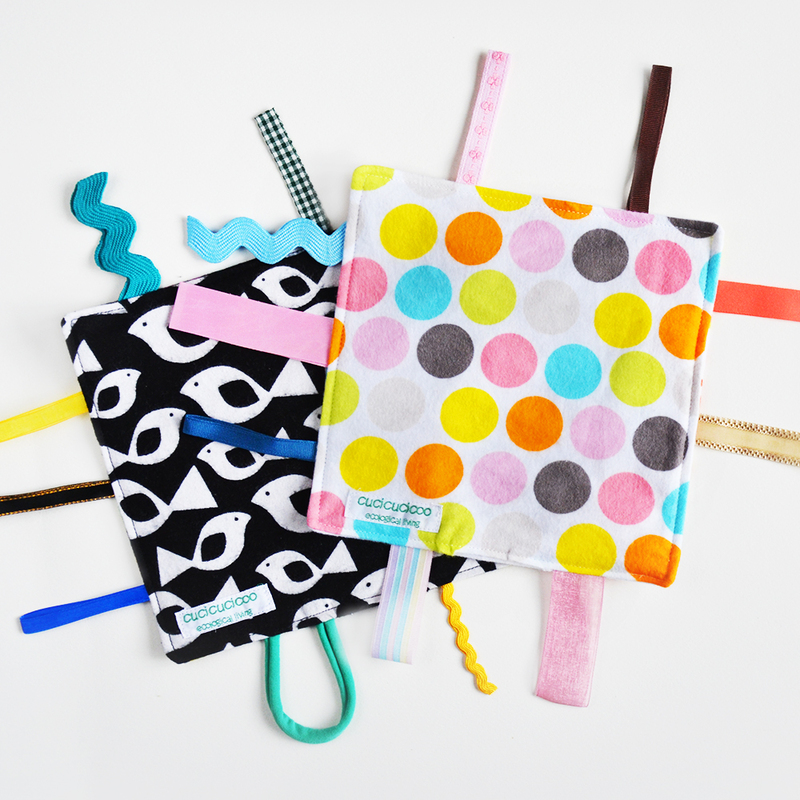 However I never created a real tutorial on how to sew these bathmats and decided to do so as the practical tutorial for the latest lesson in the Learn to Machine Sew series: the zig zag stitch! And another great thing about this project is that you just need old towels and bedsheets (or whatever other cotton fabic instead of sheets). So if you raid your linen closet and clean out things you don’t need anymore, these rugs are totally free to make! Yah! I used part of an old sheet that I’d already cut up to sew a cover for my husband’s amplifier, scraps of a green towel (that I used for the pool footmats) and a hand-me-down hooded towel for babies that was wearing too thin for me to feel comfortable with handing down to someone else. 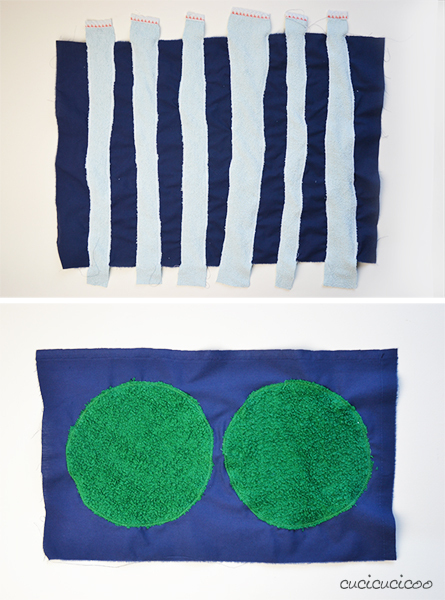 In this tutorial I will show you how to make rugs in two different styles, but you can really personalize these however you want: stripes, circles, swirls, shapes, letters… I suggest you take a look at the other posts that I linked to in the first paragraph of this post to get an idea of some options. You could also make a rectangle with a curve cut out of one long side to put around the base of the toilet. The sky’s the limit! 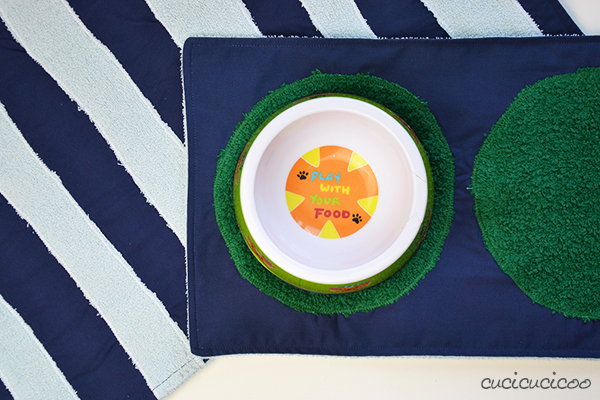 Today I’ll show you how to make a bathroom rug with stripes and a smaller rug with two circles to put your pet’s food dishes on! 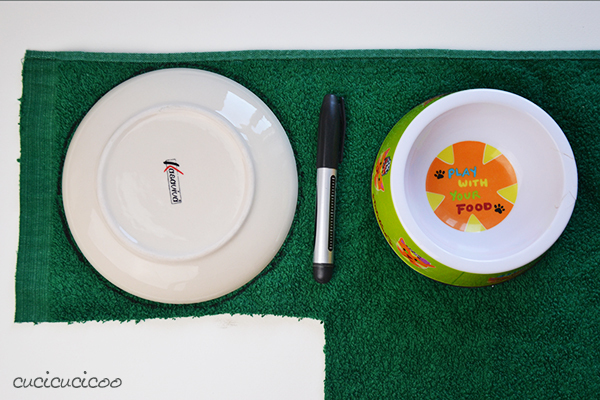 In theory it’s the kids’ job to feed and water the cat each evening before bed, so I thought it would make it fun for them to center the dishes on the circles, which are also handy for soaking up the water which always ends up sloshing out of the water dish! Let’s get started! 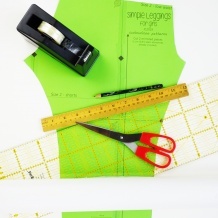 To start out, cut two equal-sized rectangles, one from a towel and one from a sheet (or woven cotton fabric). You can make these whatever size you want based on your bathroom (or other room) dimensions or however the pieces fit in best on your fabric. I’d say that anywhere from 40 x 60 cm to 60 x 85 cm for a bathroom rug is fine. 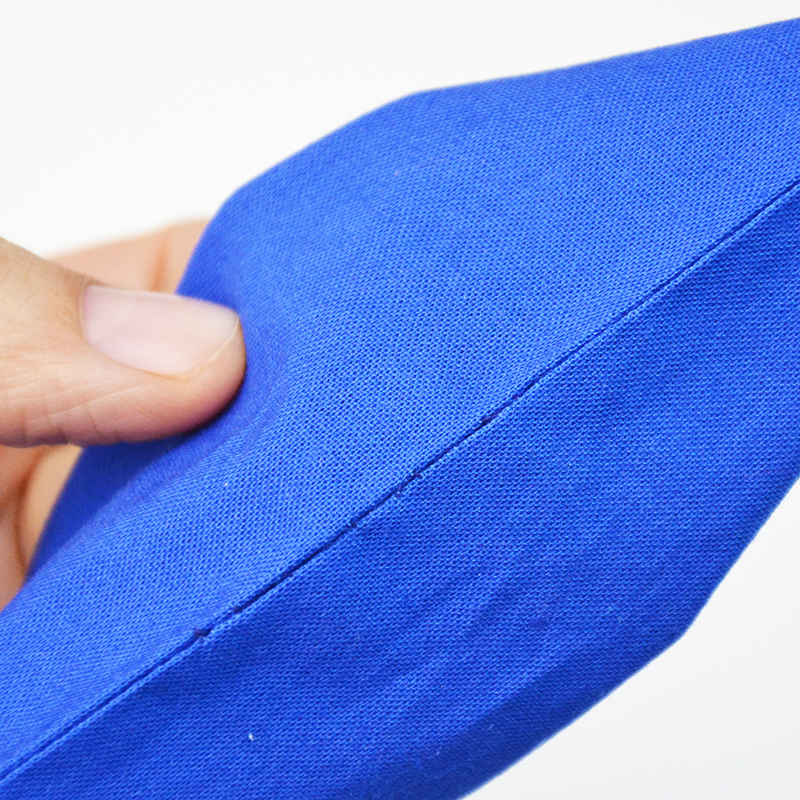 Calculate 1 cm seam allowance on all sides. 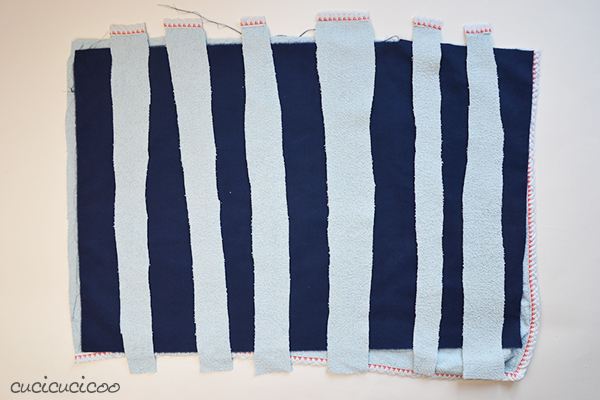 So for my striped bathrug that I made here, which is 38 x 56 cm finished, I cut 40 x 58 cm pieces. I cut 39 x 59 cm pieces for my pool mats and 27 x 42 cm pieces for the cat dish rug. Just make sure that both pieces are the same size, more or less. As you can see in the picture above, my towel pieces were slightly bigger because I didn’t trim them down perfectly, and that’s fine because I did trim them down later. I was just sure to sew along the edge of the top (smaller) layer. Then cut out whatever decorations you want from the towels. Remember that the more complicated the shapes are, the more they can slip around while you sew them, making it more difficult. I suggest keeping it simple. 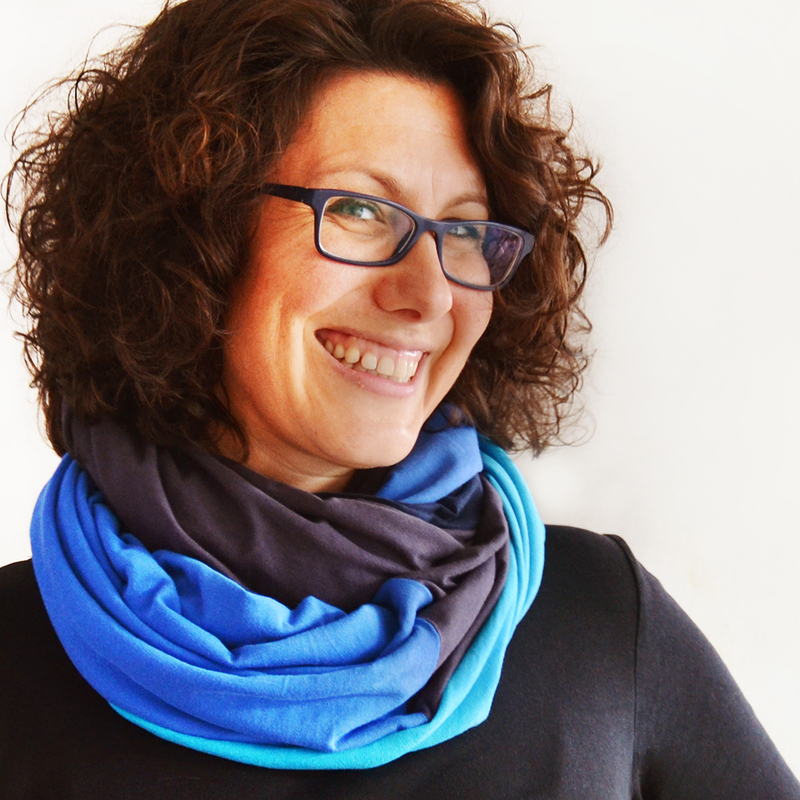 If cutting out stripes, make them sort of irregular. This project actually looks better if it’s slightly messy-looking. For my first rug, I cut out perfectly regular strips, then realized it looked weird, so I trimmed the edges of the strips to make them irregular! The important thing is that they reach from one side of the sheet piece, in whatever direction you want. 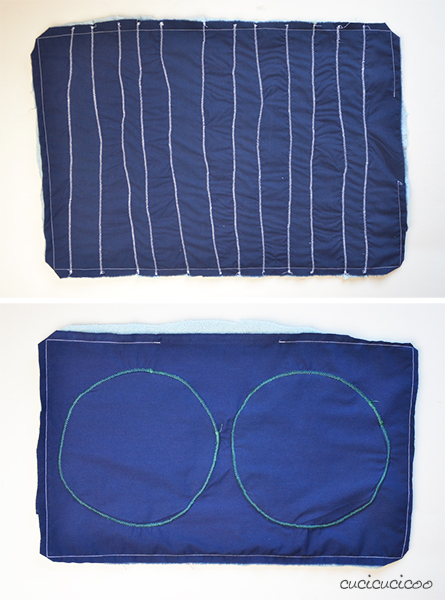 If you want to make circles for a food dish mat, just trace a plate that is slightly larger than the base of the food dish, but small enough that two can fit onto the sheet at least 2 cm from the fabric edge. I used a permanent marker to trace and just cut inside the line. Position the strips or circles or whatever shape you cut out onto the top of the sheet piece, right sides of all pieces facing up. The short ends of the strips will obviously run to or over the sheet piece’s edge, and that’s fine, but make sure that the long ends don’t get within 2-3 cm of the edges, or it will be hard to sew later on. Then pin the pieces in place. 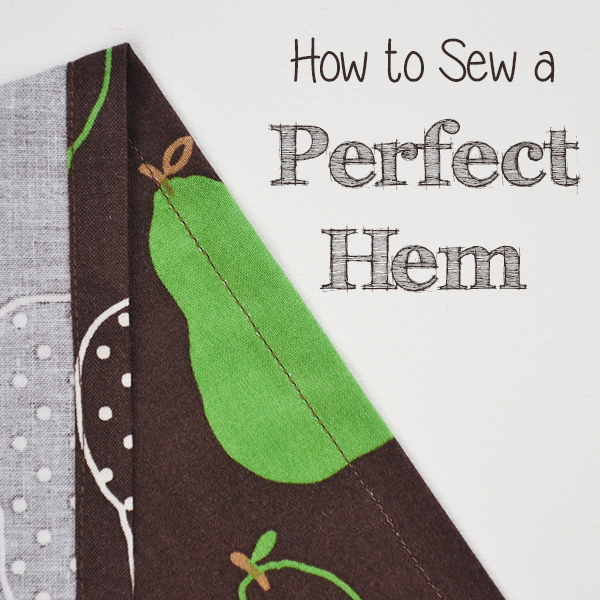 Sew the edges of the pieces down with a zig zag stitch. I used stitch width 4.5 and stitch length 1.5, but do some tests to see what you prefer. Remember that the stitching should be entirely on the top fabric, with just the very outside edge running off onto the bottom fabric. If you look closely, you’ll see that I wasn’t always super careful and the stitching sometimes didn’t go all the way over the top fabric edge, but I’m not worrying about it for this project because it actually looks better if it’s a little messy! 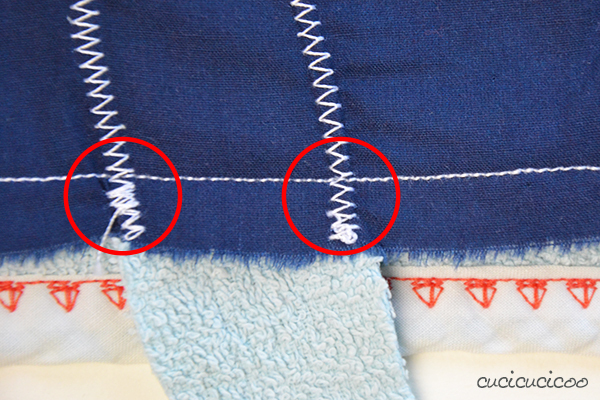 If you need help with the zig zag stitch, look at this tutorial. Also, the zig zag stitch can sometimes make the fabric a little wavy. 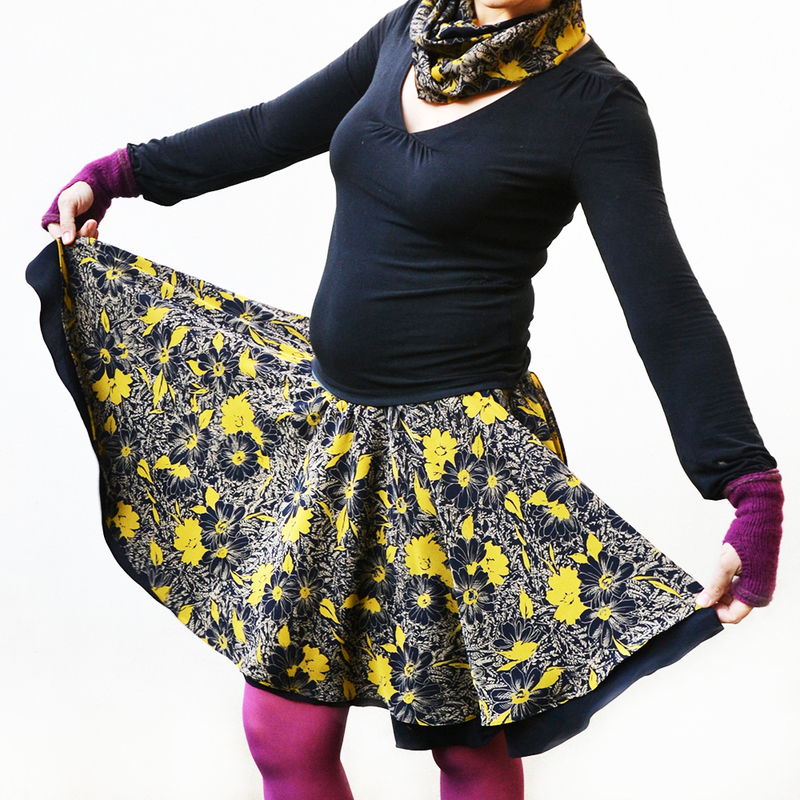 In this case, just iron it and it’ll look a lot flatter (and nicer). Position the sewn top piece on top of the bottom towel piece, right sides facing, and pin together. 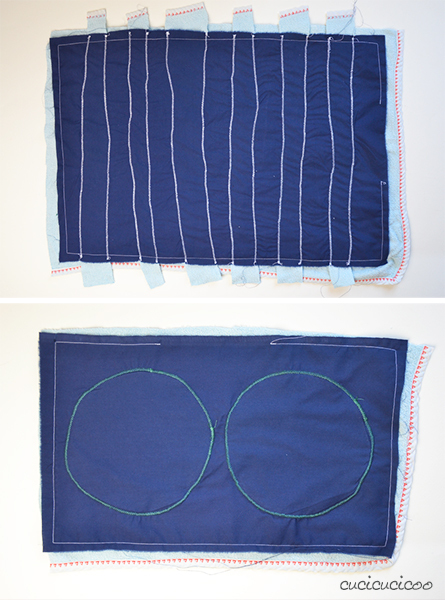 Decide where to leave an opening for turning (see here for a tutorial on turning and topstitching), and mark the beginning and end with doubled-up pins or a mark of some kind. Because the edges are straight and we will topstitch, the opening can be relatively wide on any side without strips or other shapes overlapping the edges. 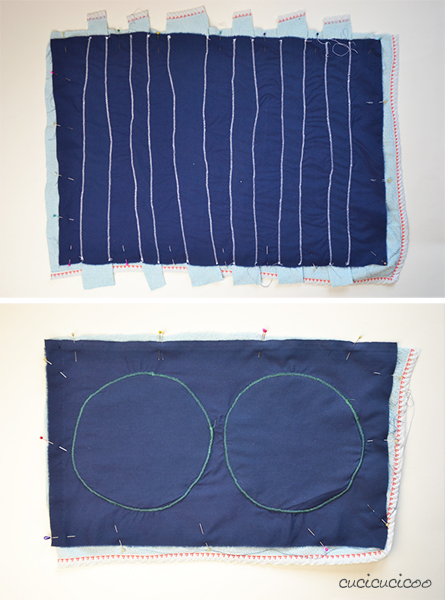 Sew all around the rectangle with a straight stitch and a 1 cm (3/8″) seam allowance, leaving the opening space unsewn. In this close-up, you can see how I sewed right over the zig zag stitching that ran up to the edge. Trim down the fabric edges if there are any excess parts sticking out and clip the corners. 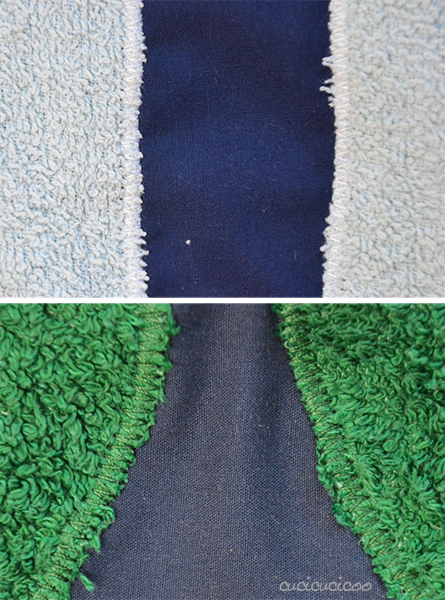 Turn the rugs right side out through the opening, poke the corners out and iron the bathmat flat. Then topstitch around the entire rectangle, closing up the opening. 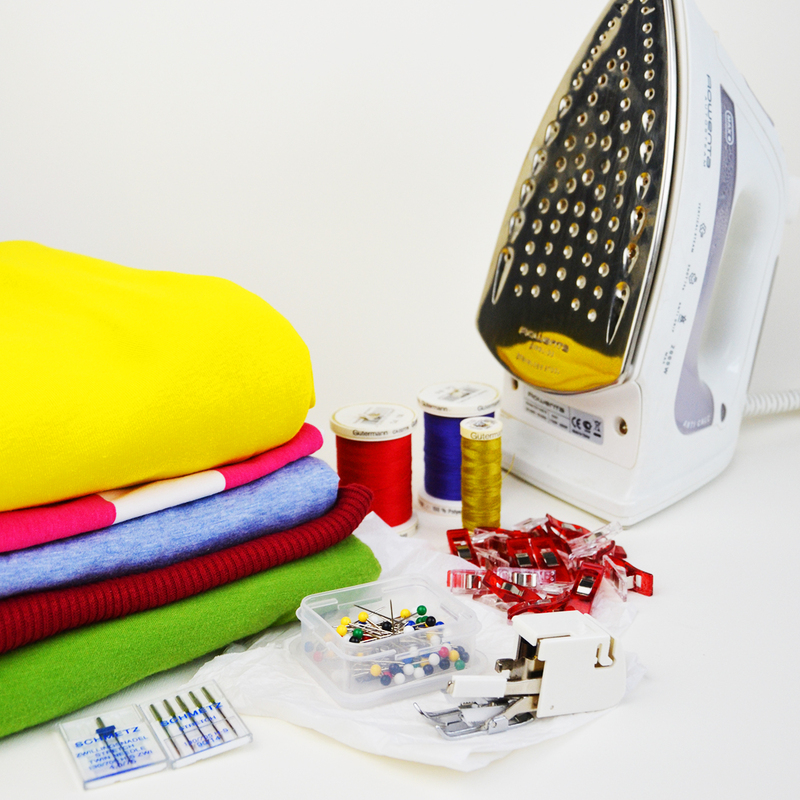 I suggest changing your needle to a 100/16 or 110/18 size to sew through the fabric bulk. Remember that you can use different colors of thread! 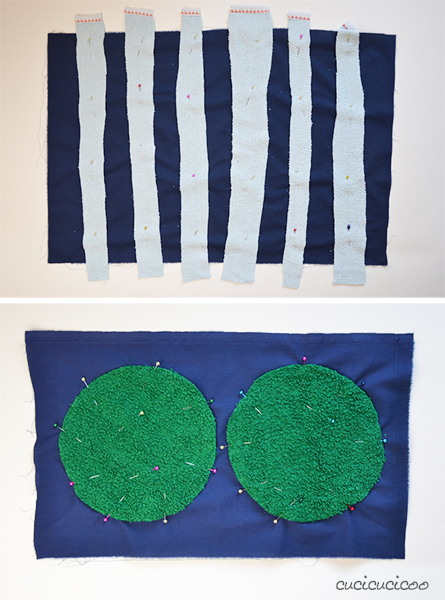 I used green for zig zagging my circles and white for zig zagging the stripes and sewing around the rectangles. 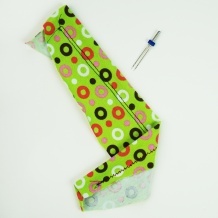 And you don’t have to use the same color for the top thread and the bobbin! 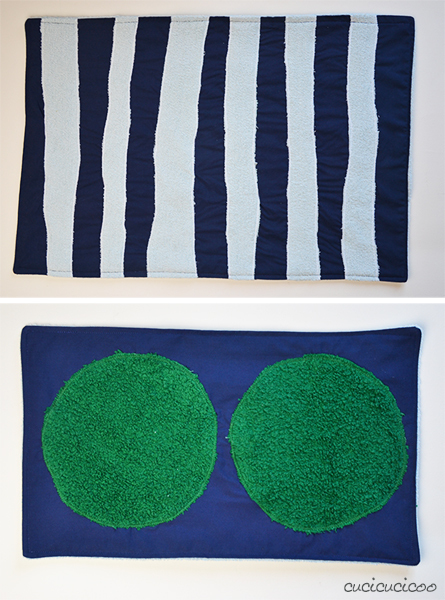 When topstitching these rugs, I used dark blue on top and white on the bottom. And there you have it! Super easy, comfortable and absorbent rugs for your bathroom, kitchen, locker room or pet… and you probably didn’t even have to pay a cent for the materials! When they get dirty, just toss them in the washing machine. Easy peasy! 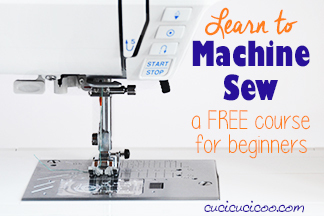 So now that you know how to sew a bathroom rug, make about five more! 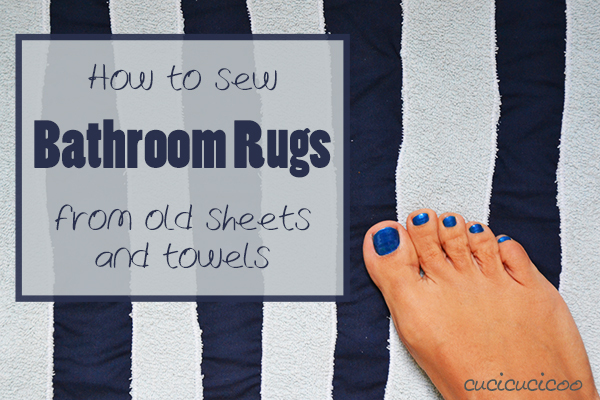 You’ll love having so many bathroom rugs to change as frequently as you need to… which in our home is about every 10 minutes! Ha! And hey, why not make some for gifts? Remember, you can personalize them to your heart’s delight! 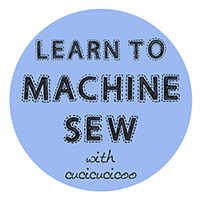 This tutorial is to practice the zig zag stitch lesson as part of the Cucicucicoo beginner’s sewing course! Non è possibile! 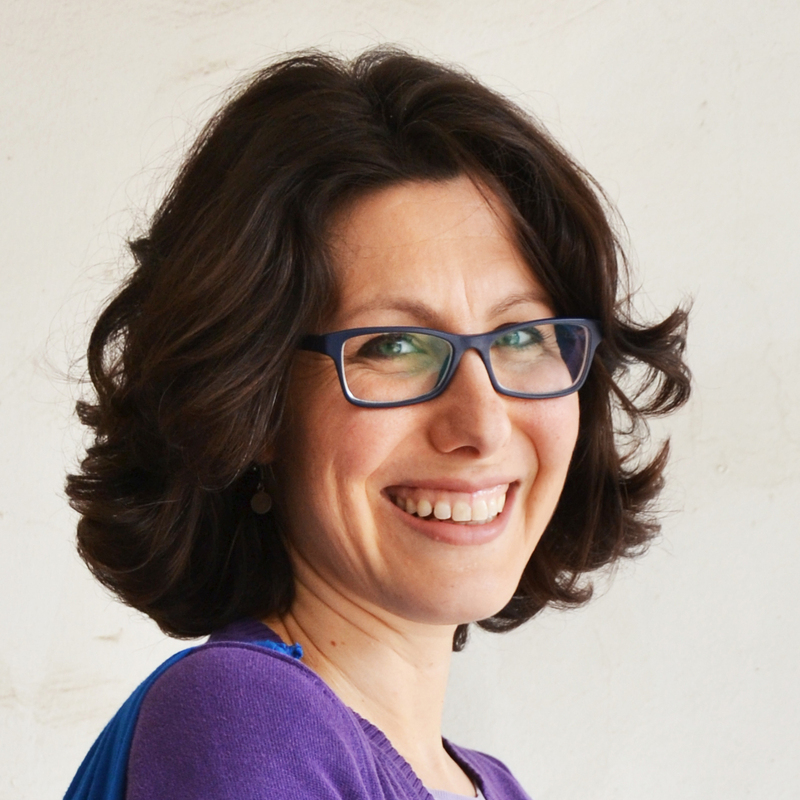 È quello che mi serviva, leggi anche nel pensiero? 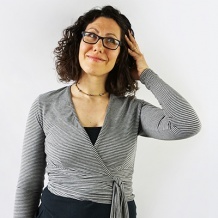 Grazie Lisa, spero di poterlo realizzare presto e mostrartelo. Alla prossima. Eh, sì, sai, Lucrezia, faccio un po’ di tutto! Ha! 😉 Sono contenta del tempisimo del tutorial per te! Non dimenticarti di farmi vedere il tuo lavoro!! i tappetini del bagno regalano sempre grandi soddisfazioni! L’anno scorso ho “salvato” un tappetino (comprato) di mia mamma, sul quale era finita della candeggina e aveva delle grosse macchie in un angolo. Ho fatto delle specie di appliques a forma di cuore, cucite con lo zig-zag proprio come fai vedere tu e ho coperto tutte le macchie! Invece settimana scorsa ho finalmente finito il tappetino per la piscina!!!! L’ho realizzato in maniera un po’ particolare e, credo, commettendo alcuni errori di costruzione (a proposito, vero che farai anche un tutorial sulle cerniere?) però funziona, e questo è l’importante 🙂 e soprattutto mi sono liberata di un asciugamani vecchio senza doverlo buttare. Presto detto! Il mio tappetino x la piscina ha uno strato impermeabile (tessuto riciclato da un vecchio parapioggia), che sarebbe quello da poggiare a terra. La cerniera corre lungo tutto il bordo del tappetino, che è ovale, e quando la si chiude il tappetino si ripiega in due, con lo strato impermeabile all’interno. In questo modo diventa una specie di “panzerotto” (la forma è proprio quella!) che posso “farcire” con le ciabatte, e quando lo metto nella borsa, tutto ciò che è stato a contatto con il pavimento dello spogliatoio rimane chiuso per conto suo. Sono un po’ paranoica, in effetti, però noi andiamo in piscina il sabato mattina, e c’è veramente un sacco di gente… tanto passaggio di persone corrisponde a più sporco in giro, è inevitabile, e con l’umido i capelli si attaccano alle ciabatte che è una meraviglia. Cute dishes. 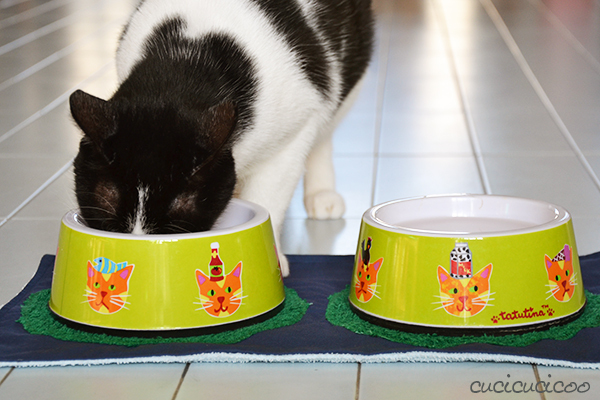 I signed up for the newsletter as I love those cat dishes. We have 3 feline rescues that keep this retire couple laughing. I saw that the company is in Pawtuckett, RI ( I hope I spelled that right). I visited there several years ago on a Quilt History Tour. I love the East Coast, so different than the “left coast”! I know, I wish they still made those dishes! They’re so cute! Cats are the best for making people happy without the difficulties of dogs, but then again, I’ve always been a cat person, so I’m a bit biased! I was born on the “left coast” and still have family there, but East Coast is where I was raised and what I know best of the States! Bellissima idea per non buttare asciugamani un pò vecchiotti! Sicuramente la copierò , ho giusto necessità di un tappeto da bagno per la casa in montagna . What a wonderful, and easy tutorial! I made one tonight for my dogs and cat’s water bowl. It’s constantly getting kicked across the kitchen floor, and as you can imagine water goes everywhere. I’m hoping that this will either prevent it from sliding across the kitchen, or if I’m especially lucky it will catch the water that sloshes out. I didn’t realize you had a sewing class up, so now I’m going to go through those. I’m a little bit more than a beginner sewer, but these look great! Thanks so much! That’s great, Autumn! I was so sick of cleaning up sloshed water, too! (Besides my kids making messes when changing it, our cat likes to play in her water, splashing it everywhere.) I’d love to see pictures of your rug! Why not send me some (lisa@cucicucicoo.com) or post them on the Cucicucicoo Creations pool?